I always have such grand plans, and I honestly stay pretty well focused while I'm there. My roommate and I are not there to play (but we do still have fun). We are there to make serious progress. But it is never enough. Once again our retreat was held at the lovely Academy Conference Center in downtown Brigham City, UT. There were classes going on in a downstairs room most of the time, so the sewing room hardly ever seemed full, though there were about 35 of us there. I haven't touched my Scrappy Trips (Bonnie Hunter free pattern) quilt since retreat last January. This time I added 12 blocks (4 of them were made after this photo was taken). Six more blocks to go. I'd better finish this up before next January! This little quilt pattern was added to my luggage as a last minute afterthought (along with a basket of HSTs), but it turned out to be the only small project I brought that I actually worked on. There are supposed to be 5 more blocks, but it is really tempting to just sew up these 4 and call it good. I think the Broken Dish blocks finish at 2"
My leader/ender blocks were added to, when the project I was sewing didn't create its own leader/enders. I almost have 200 of these windmill blocks now, and I have a bunch of them cut out. I think I will finish the ones I have cut, and then I will be done with this one. I have been doing these for years. The first two days they provided a make-n-take project at 7 p.m. I just brought home the kit for the first one--it is a project bag. 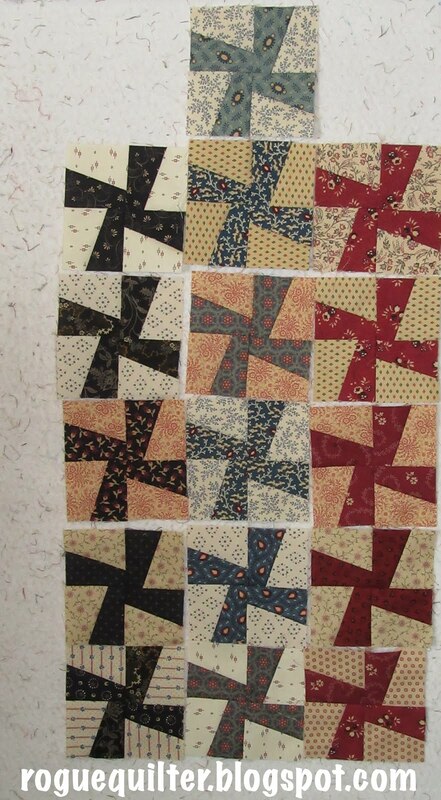 But the second day they hit me in a soft spot--foundation paper piecing mini flying geese! It all came together to make this key holder that slips onto your wrist. The retreat ran for three days and the sewing room was open from 8 a.m. to 10 p.m. We took full advantage of those hours. We were the first ones there each morning, and among those being shooed out at closing time each night--except for the last night. Technically we could stay and sew until 10 even the last night, but a good share of the quilters had packed up and left by 5 p.m. In the photo above you can see three diehard quilters to the back of the room, and the ladies to the left are employees and owner of the sponsoring shop, just waiting around for the rest of us to go home, so they can do likewise. My retreat buddy got a shot of me about this same time. We finally left around 7:30, and the other two gals were beginning to pack up to get on their way. It was a great escape--just what I needed, and just in time to preserve my sanity! My favorite of your projects is the Circa 1889 quilt. A big quilt for you to have worked on. I see you took your Featherweight along. I just recently purchased anothre one. What a beautiful facility for you to quilt to your heart's content. You made great progress on your quilts. How many rows are needed for Circa 1880 to be a completed flimsy? It's going to be a beauty! Love the circa 1880 quilt. It is to be my next leader ender project when all this dust settles. What yardage did you buy for the tan fabric. What a wonderful get away for you!! You got a lot done and are probably motivated to stitch even more. Your projects are beautiful. I have triangles in the garbage that are larger than your flying geese.....yikes! Maybe I should dig them out of the garbage! 🙈 You are gorgeous and I love the pic of you at your machine. Your scrappy trips are just beautiful blocks! Can't wait to see you finish that one. glad that the retreat was such fun! What a beautiful place to have a retreat at. Those windows. Your project is beautiflly done, Congratulations. Gorgeous sunlight streaming in through those windows while you sew....your Circa 1880 quilt is fabulous and how sweet to see the Featherweight in action! Such a dear machine. You even had time to make that darling flying geese key holder! Looks like you made great progress on your projects...I love the square 4 block Broken Dish piece - 2” you say?? Amazing!!! I'm trying so hard not to get sucked into the 1880's craze--I have several friends that are doing the blocks. Yours looks amazing! You have so many fun projects going, but I think my favorite is the little propellers--adorable! I just got back from retreat also. We don't have any hour restrictions since 16 of us rent a place together. It's surprising to me how many quit sewing early in the evening. I usually go to at least 10 or 11--I can rest when I get home--lol! Looks like it was a successful retreat for you. You got a lot done and were able to relax and enjoy the space, the company, and the uninterrupted sewing time. Glad you had a good time. Wow, wonderful post! love your projects ...always so inspiring! 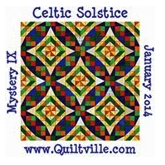 I am going on a quilt retreat next Friday for a few days...hope I get as much accomplished as you have :). What a great retreat, glad to see some other die hards would stay up late with you. Love the key fob with geese, very cute. WHat a fabulous retreat center. And your 1880's is going to be crazy good! 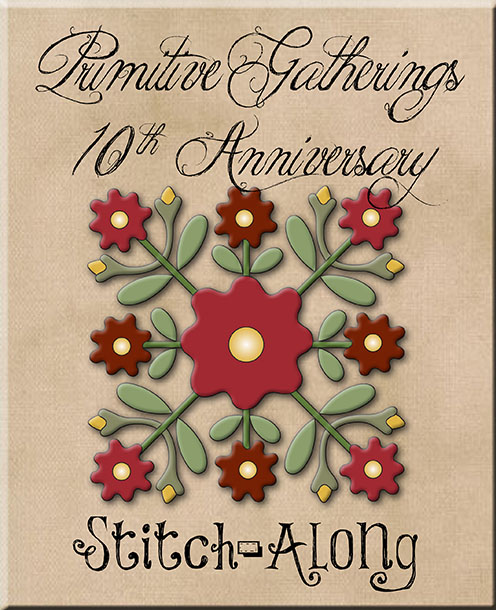 My Applique group plans 4 retreats a year, as the room is less than an hour away for all of us. we all get hotel rooms in the town for two nights and once we get the sewing room key we are free to stay all night long! I'm like you, I want to have a good time and socialize, but I'm super focused with project goals. It's the best time to "get things done"
Gosh Janet, you seemed to have achieved loads at your retreat! Well done. I especially love the key chain you have pieced. Its gorgeous. Looks such a lovely centre for the retreat to be held too. Am wondering if you felt shattered when you got home or super inspired to keep creating? Oh yes we are sewing twins! I am exactly the same way at retreat! So many projects, so little time, first at the machine in the morning and last to bed at night... and loving every minute of it! So glad you had a wonderful time away. My retreat is mid February which gives us something to look forward to mid winter and something to boost our energy to finish off the remains winter weeks until the spring comes. What a lovely facility you have there! What a lovely room. Glad you had a productive retreat. Pretty darn impressive, Janet!! 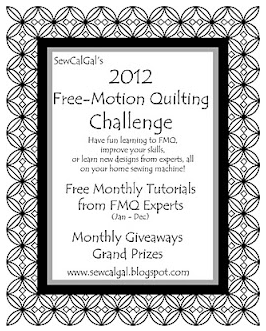 You got lots done and probably got much needed ME time and bonding with your sewing machine and fabric!! Wow! What a gorgeous retreat place! So glad you got so much done and had so much fun! All of your projects are really pretty, but I think maybe the Scrappy Trips is my favorite; those blocks are so special! ---"Love"
I need your disciple! When I go to retreats, classes, gatherings, I find myself talking, visiting, looking at others projects, snacking and shopping. You are Sew right!! I will only get 1 full day at our Guild Retreat this year. They've scheduled a quilt show the same weekend. Great progress. Wow Janet, what a fabulous retreat place! BIG tables........better to have too much to do than run out! Looks like a fantastic retreat...and, I think you got a lot done! The key wristband is cute....and I love that scrappy trip! Such a warm and cozy colorway! The Circa 1880 is beautiful too...so many little pieces! Oh my! You did accomplish a lot. I still haven't made one row of my circa 1880 quilt. Why do we always bring ten times more projects than we can actually work on? Those Broken Dishes blocks are gorgeous. I say 4 blocks is a good finish! It sounds wonderful Janet - great that you were so focussed and you still had some fun :-) I like all those projects you're working on; and the key holder is a cute fun project. Glad it saved your sanity, just in time! Oh what fun it looks like you had. Your blocks look amazing! the keychain is very cute. got a simple one at a quilt show as a little gift and I love it. I always find it right away in my bag. That room has such nice big windows. You must have been in sewing heaven! And I live all your projects!!! Especially Circa 1880! I am jealous! This retreat looks like so much fun and your projects are beautiful. Thanks for sharing. Wow, you got a lot done, Janet! Good for you. I suppose it's easier to stay focused without the interruptions at home. Even if I'm alone at home, I seem to interrupt myself with chores I should do. Your Circe 1880 blocks are gorgeous and I really like the colors in your Trip Around the World blocks. That hall -- oh my gosh, who wouldn't love to sew there! Oh, man, Janet!! You got soooooo much done at your retreat!! And your projects, as always, are just fabulous!! I know you have a roommate already, but maybe I could come join you next year? Looks like fun and lots of productivity! I go to retreat in February and I can not wait! Thanks for walking me through your retreat. I've never gone to one, as I don't think I'd be productive! Your productivity is impressive. I just love the flying geese key chain and your wonderful 1880 Quilt. What a great space!! I adore all your projects. How long was the retreat? I love to have your comments and feedback. My priorities are my faith, family, freedom and fun. I have a wonderful husband, four great grown children and five precious grandchildren. I love to quilt, read, walk, garden, make soap, watch old movies and play Euro-style board games. I am trying to come to terms with gluten-free baking. Now It's Just Quilts II! Can I do this again? An early March Mini, and something new on the design wall. A Puss in Every Corner--And Then Some!